About three weeks ago, I got two links for memo from readers, and saw another two sites that mentioned it as a new notes and/or to-do list manager. And judging by the enthusiasm, it seemed to be winning a few fans. I may be an inherent skeptic, but after a certain level of hype, I begin to doubt an application is “all that.” My skepticism was well-founded earlier this year when betty was suddenly the go-to CLI application, and it turned out to be no better than a ragged list of aliases. todo.txt is another hotly applauded title that I don’t see as particularly wonderful, but in that case it’s just the Lifehacker endorsement that clues me in. I don’t need my spider-sense for that one. My spider-sense doesn’t seem to be leading me astray this time though. memo isn’t a bad program, but I have yet to see where it suddenly upends the entire category of text-based note-taking to-do list manager tools. memo takes flags as functions and strings and dates are added. 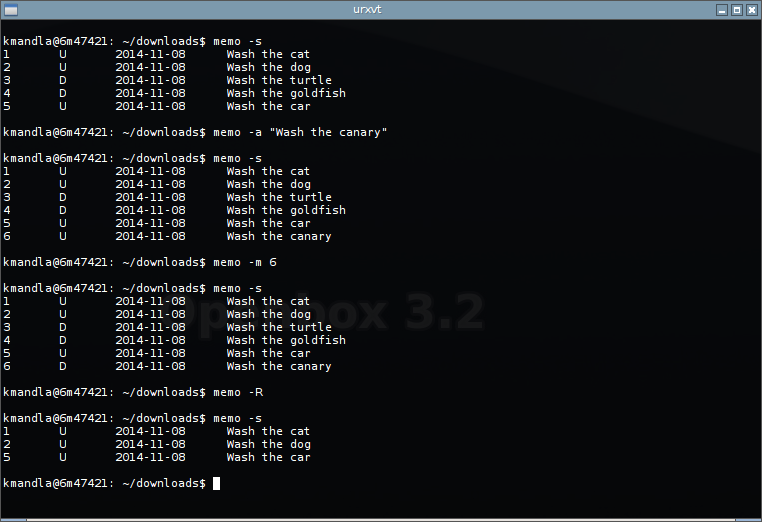 memo can handle done and undone states, can of course delete tasks, but can also weed out finished tasks. It can show notes within current dates, and mass-set tasks as completed. You can pipe strings into memo, which makes it fairly flexible as the target of another program. memo can handle plain text and regex searches, and even export its contents to a simple HTML page. To be clear, I don’t see anything wrong with memo. It has a simple focus that, yes, could be called Unixy. It has predictable output and stores its data in a flat file that is strikingly similar to what you’ll see on screen. But I don’t get the sense that it’s terrifically innovative, or has a new approach to CLI note-taking. I’ve seen dozens — literally dozens — of text-based to-do list managers in the past six months, and memo doesn’t particularly stand out against the heavyweights (like taskwarrior or the aforementioned todo.txt) in that category. memo works, I don’t deny it. If you prefer it, you use it with my sincerest blessing. But I think this is another time when a swirl of enthusiasm around a particular application has clouded the fact that it’s comparatively average. This entry was posted in Linux and tagged list, manager, to-do on 2014/11/19 by K.Mandla.